Waterbury Clock Co. "Commodore", ca. 1929. Brass cases and base, 6.25 inches high and 9.25 inches wide, ball feet. 2.5 inches signed silvered metal dials, both have beveled glass; clock, thermometer and barometer are working. Clock is wound and the hands are set by turning the pilot wheel which acts as the bezel for the clock. 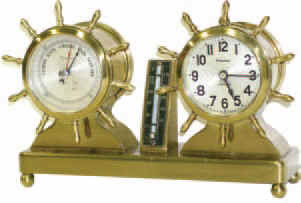 Overall, this is a nice, clean nautical decorator clock. Ly-Waterbury No. 2060.